At Surf Pro Designs, we want you to see the workmanship that goes into every surf product we produce. 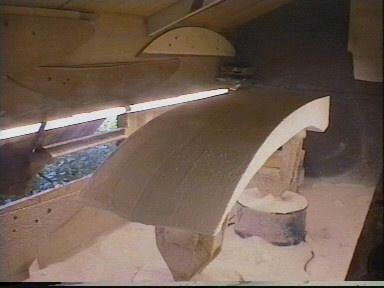 The following series of pictures illustrate the key steps during the shaping process of a Surf Pro Designs Wave Ski. The steps shown here are similar to those applied to any other surf product with a foam core. The basic foam core is cut, the bottom surface is checked for flatness and any necessary adjustments made. The rocker (bottom curve from nose to tail) is altered to suit the rider's requirements. Too little and the craft will be fast but stiff to turn. Too much and the craft will be loose but slow.